← Fit Tip: Diets with Secrets. Food costs money and eating healthy can be expensive. There are many factors that contribute to this, some examples being the distribution of agricultural subsidies and that processed foods typically have a longer shelf life. That said, disease and healthcare also cost money and eating a healthy diet is a key factor in preventing a variety of chronic illnesses. Money aside, a healthy diet makes you feel great and real food tastes better (in my opinion). Unfortunately, you are going to have to pay if you want to meet your biological needs, so here are some tips to spending less in doing so. Take Advantage of Sales: Buy the healthy items you see on sale. This is especially useful with foods that have longer shelf lives or are freezable. For example, if you see chicken breast on sale, buy extra and freeze it. Why buy the same exact product for $5 when you can buy it for $3? Buy in Bulk: Buying things in individual or smaller servings costs more relative to the amount of food you get. As long as you aren’t buying so much that it goes to waste, get the larger size. Buy Frozen: Frozen fruits and vegetables typically cost less than their fresh counterparts (especially when out of season). While fresh produce is great, it also can get expensive. Try out frozen fruits for your next smoothie or heat up some frozen veggies for your meal rather than making a fresh salad. Buy Generic Food: This is especially the case when it comes to basic foods like milk, eggs, rice and pasta. I only buy name brands when there is a significant nutritional difference or there is a significant improvement in flavor. Check out Farmers Markets: Sometimes farmers markets can be expensive, but other times you find great deals. Buying local is great for sustainability. They can also make a fun activity when the weather is nice. You can find farmer’s markets near you here. Buying local may not always cost less for your wallet, but it will almost always cost less for the planet. 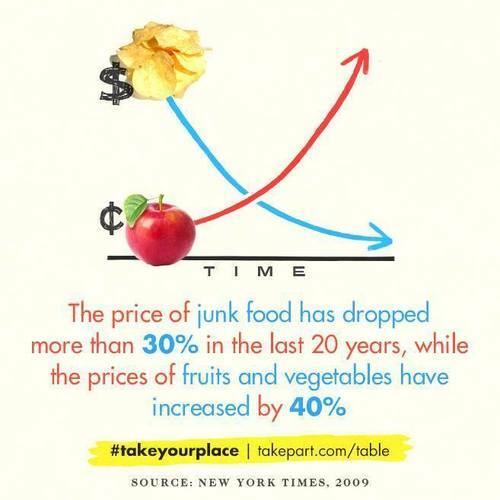 Buy in Season: Buying foods in their season is cheaper and more sustainable. To find when foods are cheapest, go here. Prepare and Cook Your Own Food: Eating out gives you less control over your food, adds a cost for the service as well as the cost for profit. Pre-cooked or prepared foods cost more in the grocery store as well. Drink Tap Water: Buying bottled water is probably one of the worst financial decisions you can make. Not to mention, it encourages the idea of privatizing water. Always have water on hand so you don’t have to buy a bottle from a store when you are out and about. If you want to filter your tap water (not that it is necessary), try out Brita or a number of other water filters. Find Inexpensive Healthy Foods: Beans are a great example of inexpensive nutritional foods. You can buy them canned (get low sodium) or dried. Lentils are my favorite because they are quick and easy to make. Eggs are another relatively cheap food that can be prepared in a variety of ways. Grow Your Own Food: Gardening is a very useful skill to have. You can control everything from seed to table. It can be a fun and rewarding hobby. Not to mention, it will earn you major Pinterest points. You don’t even need a yard to garden (although it will provide more options). Sprouts and herbs are a great place to start if you don’t have much experience or have limited space. You can also rent garden spaces in a lot of cities. For tips on gardening without much space, go here. Eating a healthy diet will probably cost more money than eating an unhealthy diet. But it also saves money in healthcare costs. You will probably need less prescription drugs and trips to the doctor in the future, not to mention lowering the risk of various types of cancers. You will be more energetic, stronger and happier. Feeling better and being healthier may even improve your work performance, giving you better chances of promotion which would increase your budget. If you are worried about the financial cost, look at where the rest of your extra spending is going and see if you can cut back elsewhere.